For over 20 years we've used the guise of Link to explore the Kingdom of Hyrule. We've been there in many different ages, and it has taken on many forms over time. Though Hyrule has proven to be a magnificent place, it was when Link stepped foot outside its boundaries that he found himself in a far more fascinating world: the Land of Termina. 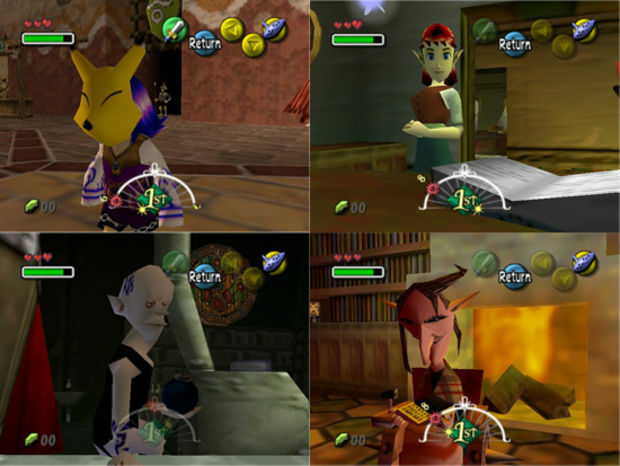 Termina is a fantasy world of The Legend of Zelda: Majora's Mask that is like a twisted reflection of the Kingdom of Hyrule from Ocarina of Time. Its characters are odd, and their storylines quite bizarre. Perhaps what makes it most interesting are that many of its themes aren't often explored in videogames. It tackles difficult elements of helplessness and despair, with its most central theme being the difficulties of facing constant failure. When we first set foot within the central town, it's caught up in a panic. The moon overhead is falling from the sky and is expected to crash down into the town in just three short days. The reason this is happening centers around a mischievous scarecrow-looking child named Skullkid. He feels that he has been left behind by his friends and has started acting out. He's been pulling pranks on people and further alienating himself in the process. Then one day he manages to steal a magic mask that grants him immense powers. With the evil might of Majora's Mask in his possession he will ensure that people will take him seriously. He will have his revenge. He's convinced the moon to fall down onto the Earth and eradicate everyone. One suspects that he will also be destroyed in the process. All of this to make his mark and get back at the people who he feels have abused him. The parallels between the actions of Skullkid and the perpetrators of school shootings is more than a little chilling. Playing through the game forces us to examine, over and over again, those who will be affected by the impending tragedy. When the days have past and we're unable to stop the massacre from occurring, we're able to go back in time to the beginning of the three day period. In doing so, however, we're dooming the town's inhabitants to their fates. 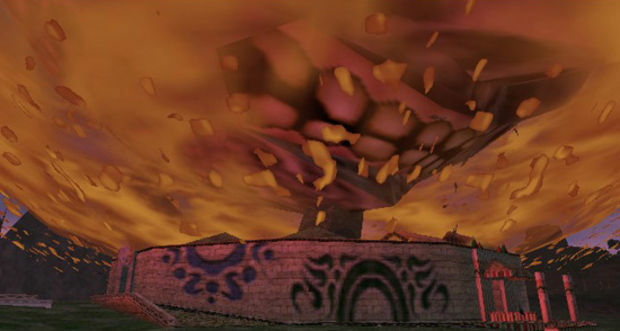 With every failure we avoid death for ourselves, but leave Termina's citizens in the path of certain destruction. And yet we go back to face them again and again until we're finally able to defeat Skullkid and stop the moon from destroying the world. Throughout the course of this adventure, we're learning more and more about the people of the town. This is not some abstract populace that we're saving, as you might see in nearly every videogame you've ever come across. We are interacting with each and every victim. We see them go on with their lives. We're forced to see them as people, not as a faceless body count. At the end of the final day, it's not an easy thing knowing that they will die because we have failed. So, it's back to the beginning to once again see the faces of the people that we have left to die, and to hopefully make it right this time. 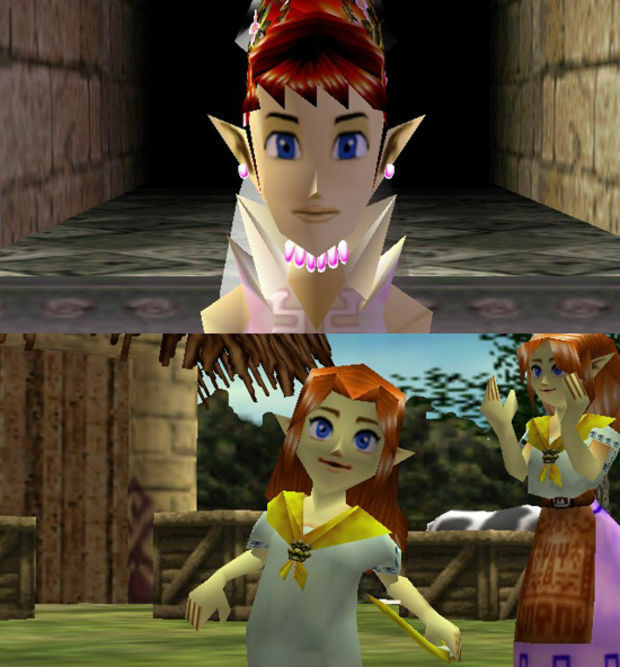 The focus of Majora's Mask isn't on the story of Link. He is not on a quest that has been destined to him by fate or granted to him by the ruler of a kingdom. He is a stranger to these people. The tables have been turned, and we are now the faceless individual. Every time that restart the time sequence, we will not be remembered by the citizens that we meet. The only time that people greet us with any recognition is when we put on the mask of dead soul, becoming them and taking over their quest. In the Goron village outside of Termina's walls, we meet the ghost of Darmani. He was a great Goron warrior who has failed in his attempt to undo some of the damage caused by Skullkid. When we put his soul at ease, he leaves behind a mask. Putting it on we become him. The Goron people recognize us as Darmani. We are fulfilling his quest to save his people. This is his legacy, not ours. Similar events occur in the town of the Zora people. Mikau, the badass Zora guitarist of the Indigo-Go's, literally dies in our arms. He, too, was on a quest to fix some of the chaos that Skullkid created in their land. Sadly, he failed and was fatally wounded by pirates. Putting his soul to rest, he also leaves behind a mask. We become him when we wear it. We cease to be Link in the eyes of the world, and become Micau. This is his quest, not ours. Yet, despite the anonymity, never has the role of a hero been so clearly defined. In no other game do we see what a difference a single person can have on the lives of others as we do here. We spend our time meeting people and seeing their problems. It becomes up to us to find the solutions. We must pick and choose at every turn who we will help, as there just isn't time to help more than even a couple of people in each cycle. When we succeed, we make a difference in each individual's life. At the end of the day, they see us as the person who saved them. In their eyes, we've taken on the mantle of hero. We're being thanked personally by the one whose life we changed for the better. We get to see the impact that we have made. Sadly, within days or even just hours, we're going to end up back at the beginning and will return to them as a stranger. What's fascinating about this game is that there is no perfect ending to this game. One story in particular showcases this fact to perfection. When we first meet the wife of the mayor, she immediately sends us on a quest to locate her missing son, Kafei. Asking around about his whereabouts brings us to his fiancee, Anju, who runs the the town's Inn. They are to be wed hours after the moon is to have collided with the earth. 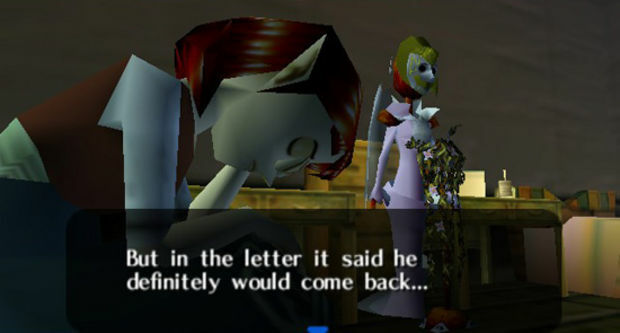 Skipping the finer details, our explorations lead us to Kafei to find that he has been transformed into a child by Skullkid. He's hiding out until he can be made normal again. There's much that we need to accomplish before we can reunite the couple. And when we do, it happens an instant before the moon comes crashing down. Kafei is still in a childlike form. While it's heartwarming to see the two together and fully devoted to each other, we must immediately move back in time to avoid being destroyed by the moon ourselves. This game keeps punching home the idea that even in success, there is failure. Even having stopped the Moon from crashing into the world and obliterating every last man, woman and child, the ending still holds much tragedy. Mikau and Darmani are still fallen heroes. In the last scene before we see Link ride off in the ending cinematic we see what is perhaps the saddest moment in the game. It's the final piece of a puzzle coming together. It relates back to the very beginning of the game. 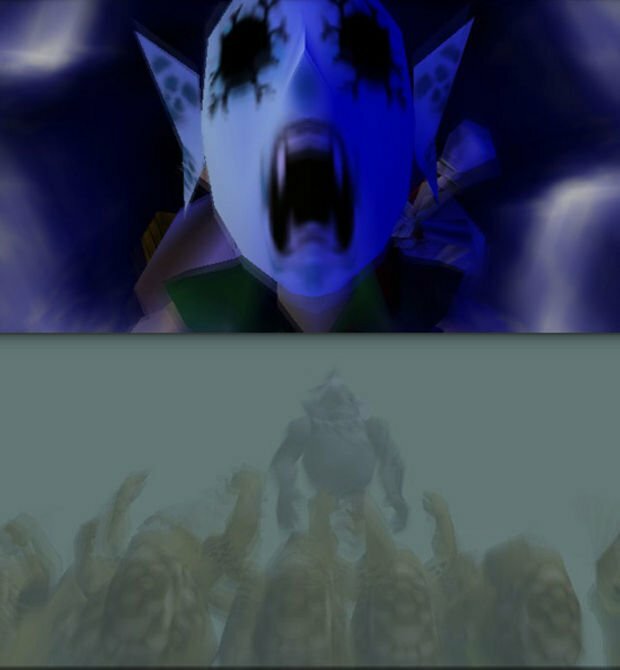 Skullkid used Majora's Mask to transform Link into a Deku Scrub. Soon after, Link and his fairy happen across a small twisted tree that appears to have a face on it. She remarks that the tree kind of looks like Link in his Deku form. Later we meet a wise Deku who is impressed by Link. He gives Link a gift to aid him in his quest after running him through a race. He mentions that he longs for the days when he would race his son the same way. But his son ran off and hasn't been seen in some time. During the finale we see that wise Deku crying before the tree. 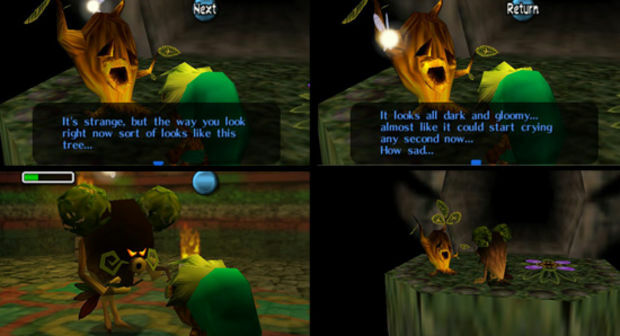 It's only then that we realize that when Skullkid transformed Link, he stole the soul of a Deku child, leaving his body to become the tree. Not everyone can be saved, the game seems to tell us. Even in victory, we may not understand all that we've lost. 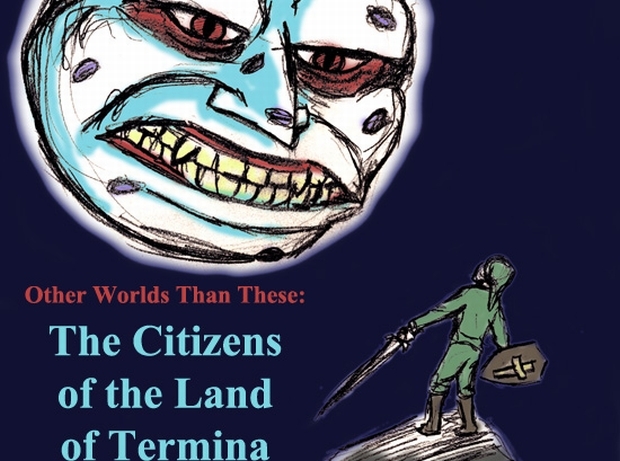 In the land of Termina, there seems to be a lot of sadness and hard times. There is no clear victory, nor is there a "good" ending where you can do everything just right and no one is made to suffer. As the game gives us inevitable failure many times over on our way to a success of sorts, it reminds us that nothing in life is one-sided. The failures are offset by the joys. In the end, we see a joyous populace. Despite everything they are happy to be alive. They are happy with whatever goals that you have helped them to accomplish. They seem ready to face the next day with full vigor. That may be this game's greatest lesson.